Dr. Fatima Ali obtained her M.Sc. Biochemistry from the Department of Biochemistry, University of Punjab, Pakistan and then received her Ph.D Molecular Biology from National Centre of Excellence in Molecular Biology (CEMB), University of Punjab, Lahore, Pakistan. She has published many research articles in international journals. 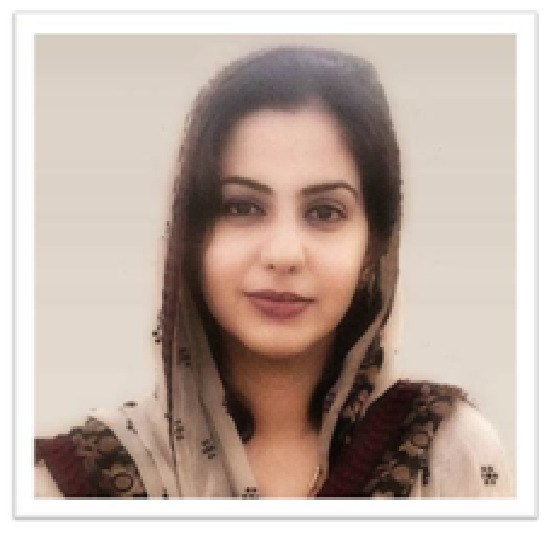 Currently she is working as an Assistant Professor in the Department of IMBB, University of Lahore, Pakistan. Polymerase Chain Reaction (PCR), Real Time PCR, Chromatography, Gel Electrophoresis (SDS-PAGE & Agarose), Cloning Techniques, etc. RNA extraction, Genomic DNA extraction, ELISA, Protein Extraction & Purification, Spectrophotometry, etc. Isolation & Culturing of stem cells from bone marrow & progenitor cells from organ like Heart, Immunostaining, Immunohistochemistry, Microscopy, Cell Viability Assay, etc. 1. Tahir Rehman Samiullah, Fatima Ali, Abdul Qayyum Rao. Production and purification of beta glucosidase from bacillus. (2011). Publisher LAP LAMBERT Academic Publishing Germany. 2. Fatima Ali and Tahir Rehman Samiullah. Production and Purification of Proteases from Microbial Source: Isolation of Neutral Protease from Bacillus. (2013). Publisher LAP LAMBERT Academic Publishing Germany. 3. Mahmood S. Choudhery, Mohsin Khan, Ruhma Mahmood, Sadia Mohsin, Shoaib Akhtar, Fatima Ali, Shaheen N. Khan, Sheikh Riazuddin.(2012). Mesenchymal stem cells conditioned with glucose depletion augments their ability to repair-infarcted myocardium. J Cell Mol Med. 2012 Oct;16(10):2518-29. 4. Mohsin Khan*, Fatima Ali*, Sadia Mohsin, Shoaib Akhtar, Azra Mahmood, Mahmood Saba, Shaheen N Khan, Sheikh Riazuddin. (2013). Preconditioning diabetic mesenchymal stem cells with myogenic medium increases their ability to repair the diabetic heart. Stem Cell Res Ther. 2013 May 24;4(3):58. 5. Nadia wajid, Fatima ali, Muhammad tahir, Abdur-rehman, Azib ali (2014). Dual Properties of Nigella Sativa: Pro-oxidant and antioxidant. Advances in life Sciences. February, 2014: Volume 1, Issue 2. 6. Fatima ali, Nadia wajid, Hina yousaf, Maria anwer (2014). Role of N-acetyl cysteine in rescue of mice heart. IJPSR Vol. 5, Issue 04; April, 2014. 7. Nadia wajid, Sanam saiqa anwar, Fatima ali, Maryam zahoor, Noman hamid, Mahtab muhammad aslam (2014). Medical Significance of Lovastatin. IJPSR Vol. 6, Issue3; accepted for 2015. 8. Nadia wajid, Sanam saiqa anwar, Fatima ali, Maryam zahoor, Noman hamid, Mahtab muhammad aslam (2015). Medical Significance of Lovastatin. IJPSR; 6(3): 1000-08. 9. Sara javed, Muhammad ali, Fatima ali, Sanam saiqa anwar, Nadia wajid (2015). Status of Oxidative Stress In Breast Cancer Patients In Pakistani Population. Adv. life sci. 10. Fatima ali, Hadia rafique, Nadia wajid (2015) N-Acetylcysteine Prevents Cord Derived Stem Cells from H2O2 Induced Injury In Vitro. EJPMR, 2015,2(3), 589-598. 11. Nadia wajid, Noreen latief, Muhammad ali, Sara javed, Sanam saiqa anwar, Rashida naseem, Fatima ali (2015). The effect of glucose on growth of mesenchymal stem cells derived from umbilical cords of normal and gestational diabetic mothers. 10.13040/IJPSR.0975-8232.IJLSR.1(6).222. 13. Nadia wajid, Rashida naseem, Sanam saiqa anwar, Sara javed, Muhammad ali, Fatima ali (2015). The effect of gestational diabetes on proliferation capacity and viability of human umbilical cord-derived stromal cells. Cell Tissue Bank;PMID: 25407535. 14. Fatima ali, Hassan jamil, Sanam saiqa anwar, Nadia wajid (2015). Characterization of lipid parameters in diabetic and non-diabetic atherosclerotic patients. Journal of Geriatric Cardiology; 11: E1-E7. 16. Ali F, Khan M, Khan SN, Riazuddin S. N-Acetyl cysteine protects diabetic mouse derived mesenchymal stem cells from hydrogen-peroxide-induced injury: A novel hypothesis for autologous stem cell transplantation. J Chin Med Assoc. 2016 Feb 25. pii: S1726-4901(16)00030-7. doi: 10.1016/j.jcma.2015.09.005.